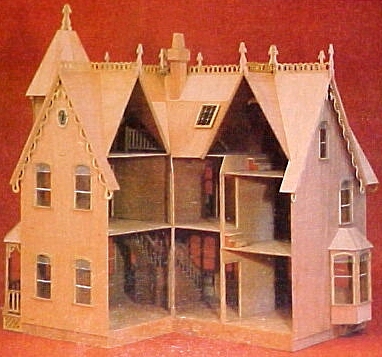 The Garfield is one of the largest and most ornate dollhouses, measuring 42" high x 41.5" wide x 30" deep when complete. The kit weighs in at a monster 52 pounds, and contains everything you need to make a fabulous 10 room Victorian with all the charm of days gone by. There's a tower, a secret chamber, lots of gingerbread, and a wonderful wrap-around veranda. There are balconies, French doors, bay windows and great features like window seats, bookcases, fireplaces, and a split staircase. 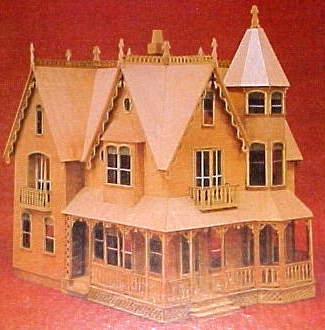 The Garfield Mansion Kit comes with fully illustrated assembly instructions and silkscreen printed windows.